The British Embassy in Bolivia is close to the US embassy in La Paz. the is also a Honorary Consulate in Santa Cruz. If you are a British national in Bolivia then speak to the embassy staff about registering your marriage in Bolivia, registering a British national born abroad or registering the death of a British citizen. They can also offer you consular assistance such as calling your family if you have died, bee in an accident or been arrested. You can also apply of a British passport or renew your passport at the embassy in Bolivia. The contact details are listed below with a telephone number, email address and also their operating hours. 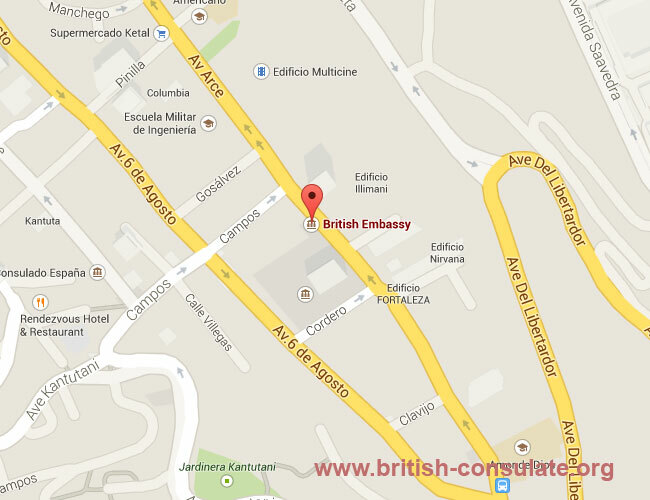 Note there is also a map to the British embassy in La Paz Bolivia.